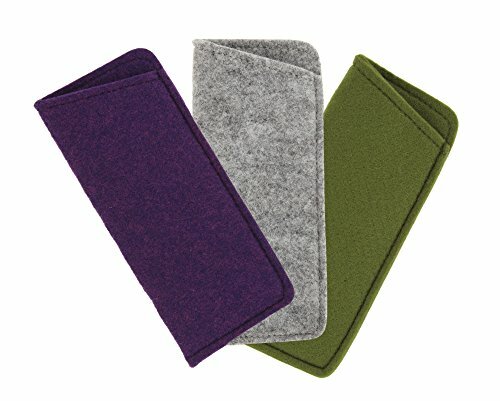 Protect your expensive eyewear in style with this 3 pack of felt slip in eyeglass cases from Ron's Optical. Simply slip your reading glasses or any other small to medium sized eyewear into the case, and you're done. No zipping, no snapping, just slip in and go! This handy 3 pack ensures you have one on hand wherever you go- keep one at home, one at the office, and one in your car or purse! Each case is made with a super soft felt that protects your lenses from scratches and scuffs. Available in a rainbow of colors - get your favorite color, or buy multiple colors to match any outfit or mood! This listing is for 3 felt slip cases in Purple, Gray, and Olive. These simple yet highly functional cases are extremely slim, so they will fit easily into any purse, bag, or even a jacket pocket. Exterior dimensions measure: 6.5 inches long and 2.75 inches wide (Metric: 16.51 cm long and 6.99 cm wide). Each quality eyeglass case is hand packed with care in Dallas, Texas. Easy to use slip case - no zipping, no snapping, just slip in your glasses and go! If you have any questions about this product by Ron's Optical, contact us by completing and submitting the form below. If you are looking for a specif part number, please include it with your message.